Young trees are pruned to develop a tree structure that supports the limbs that ultimately support the heavy fruit load during the season. The goal of training is to develop a sturdy tree and a canopy that is capable of producing large crops and fills its allotted space. Training occurs during the first 2 to 3 years after planting and should be completed before fruit is allowed to set. Almonds, apricots, peaches, nectarines, and cherries are usually trained to an open vase or modified vase system where the center is open and has 3 or 4 main scaffolds with no central leader. Peaches and nectarines are not suited to trellising because they bear fruit on 1-year-old wood and so require heavy annual pruning to keep them productive. Figs and Japanese plums can be trained to the open center vase or to a delayed open center. A delayed open center system is similar to the open center but has wider spacing between scaffold branches. Because figs are prone to winter injury in colder climates, it is best to grow figs as a bush, where they can push enough new growth to produce a crop after cold injury. They should be pruned in late winter to keep in bush form by cutting back to about 8 feet. Walnuts, European plums and prunes, and sometimes cherries are trained to a modified leader system where a central leader is allowed to grow to a height of 5 or 6 feet and is then headed to an outward growing limb. Young walnut trees are best pruned for training in the early spring just after the buds start to swell. This ensures that live wood is available for establishment of the tree's framework. As the tree grows, limbs that develop from buds on the ends of very short shoots or from "necked buds" tend to be weak and break out easily. 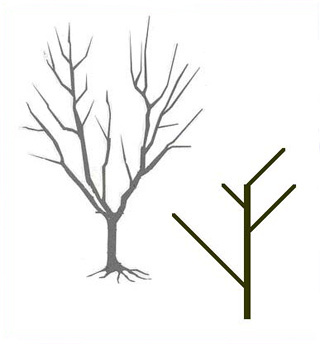 Remove necked buds to favor the development of widely attached branch angles. Remember that exposed limbs on young trees easily sunburn. Protect exposed limbs with a 50:50 mix of white interior latex paint and water or whitewash.